→How to install WordPress in 3 minutes! If you are not using cPanel (Most widely used PHP server control panel), you can contact me and let’s see how to work this out on your server. Some other web hosts have SimpleScripts and Softaculous. These are all scripts aimed at simplifying WordPress and other scripts installation. Installing using FTP is outdated and time consuming. It’s a bit more complex than the cPanel click-to-install procedure. Uploading files, creating database manually and following the installation wizard can really be a daunting task. Let’s avoid it. Login to your cPanel dashboard and locate the Software/services tab. You should figure out something like the image below: NB: If you are following these tutorials and have not bought your web hosting package, check out this post on which hosting company to use. That means you should click “Fantastico” (as shown on the image above) to move to the next screen. 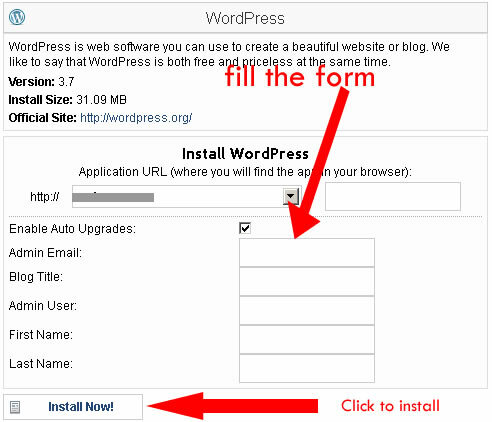 Click “Install WordPress” and on the window that follows, you will simply be required to confirm the installation. I recommend you enter your email to receive the installation data. That will be the final step after installation. On the window that shows up (screen below), select the domain from the least. Leave the extension folder empty if you want your blog to root from the root, that is http://yourdomain.com. If you want it to run from a sub folder, enter the folder name, for instance http://yourdomain.com/blog. Enter the Admin email address, Blog title, admin username (avoid admin), your real names (first and last). After filling the form properly, click “install now“. QuickInstall will also go ahead to install WP-Super-Cache, which is a site performance plugin. It’s highly recommended and I have nothing against that. However, we will go with W3 total Cache which is also a highly recommended performance plugin. Given that the two cannot cohabit, if you install with QuickInstall, WP-Super-Cache will have to be removed as we move on. Now you have a raw and vulnerable copy of WordPress installed. In Part VI, we are taking care of security. I’m showing you how to lock your copy and configure an automatic backup of your blog. Check out Part VI here and share your thoughts below. Pretty much useful for people just starting out with WP. well very nicely explained and looked too simple, i was not aware, so now i can install in 5 mints 😛 =D . Great work! This will be very helpful for those who are just starting their blogging journey. Well wordpress is a great choice to blogging, of course its free and easy to customize. The post is really detailed and we can follow each and every thing by reading it. Good to see you around Rahul and thanks for the comment. I’m loving the engagement and checking your blog too. You have made this tutorial super easy by the figures and directions. Keep it up mate.